To enquire about the Fat Freddy II please use our contact us page. The Fat Freddy II is the ideal, two berth, trailer tent for touring the country. It is incredibly easy to set up, taking less that 5 minutes, making it perfect for short stays when travelling. 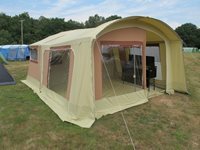 The trailer tent comes complete with an awning to provide a large living area. The awning sides are fully removable to enable it to also be used as a sun canopy in hot weather. The bed is accessed via a ladder and there is a storage area under the bed that is easy to access even when the tent is erected. 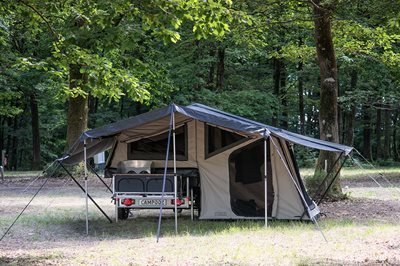 As with all models in the Campooz range, the Fat Freddy II is equipped with the Clima-C System for optimal ventilation to ensure a comfortable temperature day and night. There is also the ability to remove the entire tent, using the wrench provided, and use the trailer for transport year round. There are a range of optional extras to further tailor the Fat Freddy II to your needs, and for those adventurous campers the Fat Freddy II can also be supplied on an off road trailer to deal with harsher terrain.